2015 is a crucial year for the future of humanity, leading up to the Paris climate conference in December. Process, with music, along Winchester High Street to the railway station for a short rally at about 11.00 am and see off the group travelling by train to the national demonstration in London. Please join us if you represent an organisation, bring your banner, wear your t-shirt or uniform if you have one. We need people to be a steward so please volunteer. Can you help get the word out? Encourage others to come? put it on your Facebook page? Leaflet in Winchester High St for one hour on the morning of Saturday 31st October between 10 am and 12.30 pm ? Leaflet your street about Paris and the People’s Procession for Paris at any time in November? Ask people in your church to come on their way to Sunday service? Ask someone eminent to march with us? Leaflet your neighbours in November to encourage them to join our procession? We can give you as many flyers as you need. put a poster in your window or worplace or community building? Or ring Chris on (01962) 827083. We’d love a few people to prepare songs and music for 29th November. 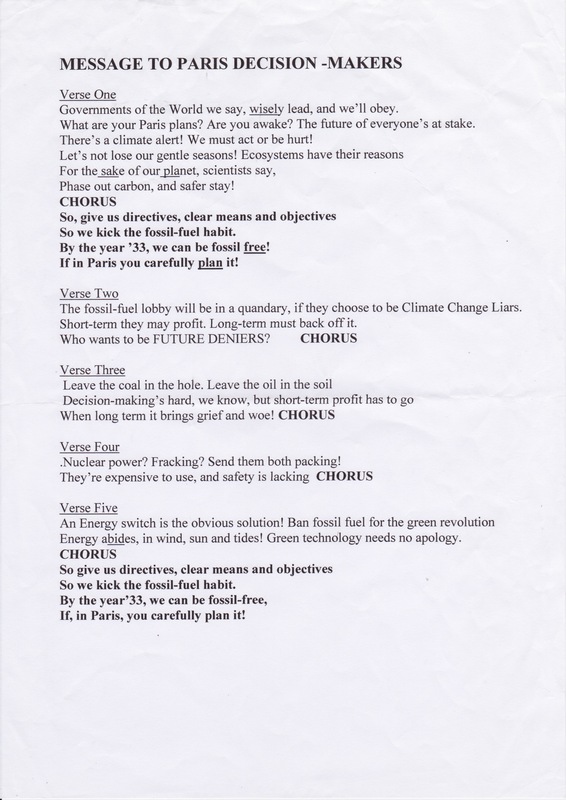 Sing our poem “For the love of our planet” to the tune of “Do You ken John Peel”, ?or sing the song on this video “What can we do about global warming” to the tune of “drunken sailor” or rap this rap. Let us know if you could join our small choir or play for our procession – email sing4Paris@winacc.org.uk text (07779) 283451 or ring Chris on (01962) 827083.